· Many short-legged cats have been seen in different places around the world for many years. · They have been recorded in the United Kingdom, Russia and the United States. · Breed establishment started in the United States in the 1980’s with a pregnant short-legged cat being the foundation of today’s Munchkins. · After years of supervised breeding, the Munchkin obtained championship status in 2003. · The Munchkin’s coat is considered to be an all-weather coat. The eyes are walnut-shaped giving the Munchkin an alert expression. · The coat can be short to semi-long to long. · The coat is plush and silky. · All coat colors and patterns are recognized. · The body is small to medium-sized. · The average weight of the male is 3-5 kilograms and the female is 2-4 kilograms. 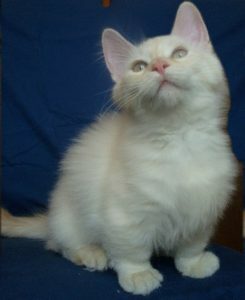 · The Munchkin has short legs, which is the breed’s outstanding and unique characteristic. · The tail is the same length as the body and tapers to a rounded tip. 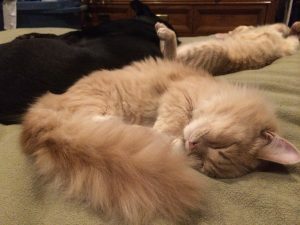 The tail is plumed in the semi-longhair cats. · The ears are set high on the head. The Munchkins are affectionate lap cats. · They generally have a calm personality but occasionally can be extremely playful and love to run and chase things. · They are sociable cats who love the company of adult humans, children, other cats and even dogs. · The Munchkin sometimes love to talk. · Munchkins are curious cats who will sit up on their hind legs just so to get a better view of whatever it is that caught their attention. · Munchkins are highly intelligent. Having short legs, they can jump up to only a limited height but they are very good at figuring out a path that takes them where they want to go. · The Munchkin sheds moderately so regular grooming and proper nutrition is necessary. · Grooming is not difficult. The short-haired ones must be combed at least once a week while the long-haired ones at least twice a week. · This breed is best suited to an indoor lifestyle. · With proper care and nutrition, the Munchkin can live up to 15 years or longer.